A postman has been caught on camera routinely pepper-spraying a local family’s small rescue pup. The devastated Galindo family were only alerted to the alleged animal abuse after repeatedly seeing a strange stain on the front drive of their California home. The dog’s father, Alfonso Galindo decided to investigate and so installed security cameras on the exterior of his family’s house. 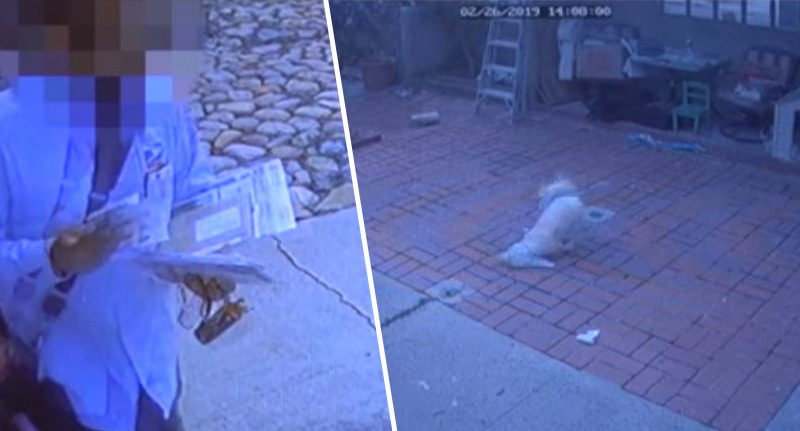 The footage shows his family’s beloved seven-year-old rescue dog, Pupa, writhing around in pain as a postman exits the approach of the Galindo home in San Diego. Upon closer inspection, the father-of-two (not including dear Pupa), noticed the postman appeared to spray something from a canister at the poodle’s face, after the dog barks excitably from behind a secure gate. The video then shows Pupa rubbing her sore face and eyes against the pavement, in a clear bid to rid herself of the reportedly pepper-spray-like material contained in the canister. Having watched more footage from the security camera, Galindo says Pupa ‘convulses in some sort of ritual pain’ when the postman passes their gate on at least nine different occasions. Never did I suspect the mailman. Never did I suspect somebody that you trust with your mail, with your packages. It was heartbreaking, it was really heartbreaking. I’m at a loss for words. It makes me sick to my stomach. In hindsight, he says he remembers noticing the dog’s eyes were bloodshot but thought nothing of it at the time, as the redness cleared up pretty quickly. To make matters worse, Galindo says his two children – Alfonso Jr., three, and Regina, one – have developed respiratory problems after regularly interacting with Pupa. He believes his children’s health issues are related to the chemicals in the canister contents used on Pupa, staying on the dog’s fur, although this hasn’t been confirmed by a medical professional as of yet. I get livid thinking about it. This is the health of my children. I believe what he’s done to my family is criminal. Galindo complained to USPS last week, after making the discovery last Tuesday. On behalf of the United States Postal Service, we want to apologize to the Galindo family and Pupa. We do not condone our employees behaving in a manner which is not professional and courteous. We thank everyone for the good wishes and all of the prayers directed our way. We really can't believe all of the moral support we have received. We expect Pupa to be back to her normal soccer playing self soon. #justiceforpupa Now the concern is the kids. The mailman is question remains unidentified to the public.